Yamaha will introduce more than 90 new products at the 2018 NAMM Show. "From our launch of more than 90 innovative products, to our All-Star Concert on the Grand, we will deliver a memorable and rewarding NAMM experience for all," said Mr. Hitoshi Fukutome, president, Yamaha Corporation of America. 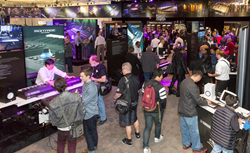 The Yamaha booth will again occupy an exhibition hall the size of football field in the Marquis Ballroom at the Anaheim Marriott Hotel, located adjacent to the Anaheim Convention Center. The company will provide a wide array of news about new products and artist performances from the "Heart of Inspiration" stage for music fans around the world, which can be enjoyed at http://www.yamaha.com/namm/ beginning January 25. Yamaha is also hosting a multi-artist, multimedia extravaganza for all attendees with the "Yamaha All-Star Concert on the Grand 2018" on Friday, January 26 beginning at 6 p.m. on the NAMM Yamaha Grand Plaza Stage. The entire plaza will be powered by the company's award-winning commercial audio gear, including the RIVAGE PM10 Digital Mixing System and NEXO line array speakers. "Yamaha will have a massive presence at the NAMM Show, and we can't wait to share our excitement with the tens of thousands of show attendees this week," said Mr. Hitoshi Fukutome, president, Yamaha Corporation of America. "From our launch of more than 90 innovative products, to our All-Star Concert on the Grand, we will deliver a memorable and rewarding NAMM experience for all." In the Keyboard product area, a wide spectrum of Yamaha products will be displayed ranging from premium pianos to new digital pianos and flagship digital workstation, while Bösendorfer will unveil 3 new grand piano models. The company's Pro Music division will showcase the first-ever, stand-alone acoustic drum module system as well as new models of acoustic and electric guitars, while Line 6 will exhibit its products at the Grand Ballroom located adjacent to the Yamaha main booth. The Band & Orchestral division will also display a variety of new wind instruments and drums. The Pro Audio division will introduce new commercial audio solutions, while Steinberg will showcase a full range of new software offerings in the Marquis Ballroom.